And so, it came to pass that when we woke up this morning, some thirty hours after the launch of the Epic Death! campaign, it funded - and all was good. First though, we've had a few messages about the Bonus Pack that's mentioned a few times on the main page and what exactly these Event things are. Never being ones to hold back, why not have a look for yourselves? To get a proper look at the cards, click this here link. 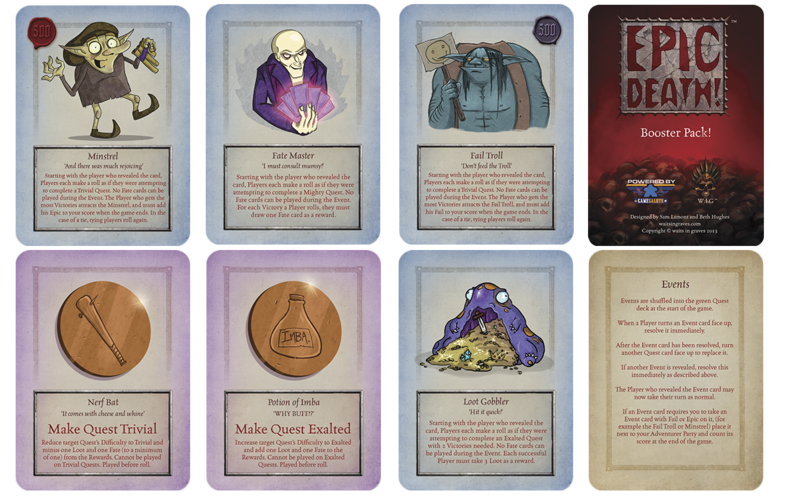 This is the Bonus Pack in its entirety - the two Fate cards can really mess up your opposition while also helping yourself, but today we're going to look at the Events. These are one-off occurrences that are shuffled into the top half of the Quest Deck along with the slightly simpler tasks that your Party will have to deal with. When a player flips one up, it has to be dealt with IMMEDIATELY - no messing around - but you won't be tackling it alone... oh no. Everyone gets involved, whether it's attempting to attract the Minstrel in a bid to gain more points at the end of the game or trying to gain the assistance of the Fate Master! Sorry guys - looks like the link changed and we can't edit the updates once they've been posted. Most annoying, but click on Sam's link below for all your Events Card Imagery needs. Hey Dave, the link is working ok for us. Are you still having trouble downloading the image? The Link seems to have suffered an.... Epic Death! It was nice to move the slider from 4980 to 5025. I am really looking forward to the game.